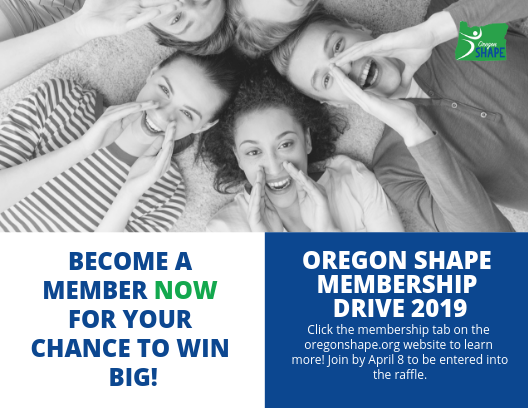 Become a member of Oregon SHAPE today! Join here. The first annual Oregon SHAPE Membership Drive is happening RIGHT NOW and ends on April 15! How does it work? How do you win? All new and current members who refer their colleagues will be entered in a raffle and have a chance to win some BIG PRIZE$!!! From now until April 15 all new and current members will be BIG winners just by joining the organization, and have a chance to win even BIGGER by being entered into some exciting raffles! We’ve given you access to a PDF file and a PNG file to download and share out with your colleagues via e-mail or social media! Make sure to tell them to include your name on their application form, so we can give you credit for the referral! This is the only way you will receive credit for a referral. Why become a member of Oregon SHAPE? Oregon SHAPE is continually striving to increase and improve member benefits. We are working to develop scholarships, grants, and partnerships that benefit you, the Oregon SHAPE member. We have some exciting things coming up and are looking for you to join the team of dedicated professionals across the state! What does your annual membership fee get you? We are the state affiliate of SHAPE AMERICA, our National Association. Members receive a reduced annual conference cost. FREE Registration for workshops, including our NEW Leadership Conference. Members are eligible to become involved in Oregon SHAPE leadership opportunities. Voting member in Oregon SHAPE Elections. Eligible for Oregon SHAPE Teacher of the Year Award & support to pursue national awards. Have a voice in legislative and policy decisions related to health and phyical education. Join Oregon SHAPE’s team of advocates who work to protect our profession locally, state-wide, and nationally. Participation in our new scholarship fund – $10 of your fee goes into the fund! Eligibility to apply for the scholarship fund that you can put towards conference attendance, purchase of learning materials, etc! The opportunity to give back to our profession and help Oregon SHAPE grow to meet the needs of our profession. *Membership lanyards and t-shirts will be available for pick up at this year’s conference. To access this information in a handout, click the Benefits of Membership link to download. To become a member of Oregon SHAPE click here.